Doctor Who And Son (In Law) | Warped Factor - Words in the Key of Geek. 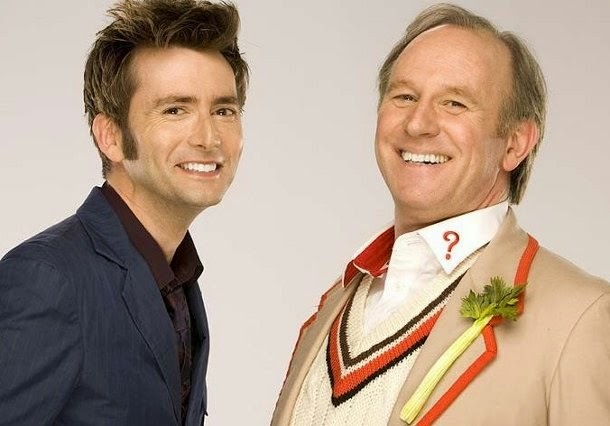 As we at WarpedFactor celebrate the Tenth Doctor, David Tennant, and his father-in-law, the Fifth Doctor, Peter Davison, celebrates his birthday, what better time to take a look at the lessons young David might have learned from watching/studying the man with the decorative vegetable during his own time in the TARDIS. But are there any hints of Peter D in David T's performances even before that? 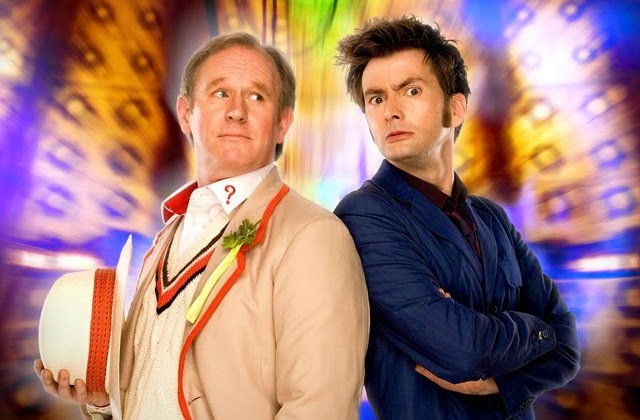 To start with, both faced difficult tasks following their acceptance of the key to the TARDIS in the first place as they took over from massively popular past selves- Peter's Fifth Doctor the youngest-looking incarnation of the Time Lord until Matt Smith came on the scene, as well as arriving in the wake of Tom Baker's Fourth. David's Tenth of course found himself in the position of stepping into the shoes of the first 'new series' Doctor, the man who'd kick-started the revival of the programme, though both would be well remembered by their respective generations of fans at the end of their own tenures after taking the decision to leave the role. But of course any confusion arising from "this little trick" of Time Lord biology would soon wear off. Both Doctors would prove themselves friendly and compassionate, eager to find a non-violent solution to any dispute, and regretting those occasions when brute force won out- consider the younger & more favourably disposed to cricket one's response to the bloody battle which makes up the final act of Warriors Of The Deep. We can now turn our attention to The Doctor's Daughter, which also served as the start of a romance which would see the man who played the Doctor start a romantic relationship with the daughter of a former Doctor (Georgia Tennant, nee Moffett) who would later become his father-in-law. You'll recall the point at which the Doctor does a very un-Doctorish thing & picks up a gun...........lets first take a look at the build-up. "You can't win. No one can. You don't even know why you're here. Your whole history, it's just Chinese whispers, getting more distorted the more it's passed on. This is the Source. This is what you're fighting over. A device to rejuvenate a planet's ecosystem. It's nothing mystical. It's from a laboratory, not some creator. It's a bubble of gases. A cocktail of stuff for accelerated evolution. Methane, hydrogen, ammonia, amino acids, proteins, nucleic acids. It's used to make barren planets habitable. Look around you. It's not for killing, it's bringing life. If you allow it, it can lift you out of these dark tunnels and into the bright, bright sunlight. No more fighting, no more killing. I'm the Doctor, and I declare this war is over." The death of Jenny, his titular daughter, goes on to inspire him to pick up the gun and take aim at General Cobb! Putting it down, he delivers an impassioned speech imploring them not to do as he might have in a moment of weakness. "I never would. Have you got that? I never would. When you start this new world, this world of Human and Hath, remember that. Make the foundation of this society a man who never would." His younger self would no doubt doff his Panama hat in approval, you'd think? Speaking of him, it would appear that while he would later be scoffed at for his choice of celery as a lapel adornment, several of his fashion choices rubbed off on the Tenth Doctor. "You know, I loved being you. Back when I first started at the very beginning, I was always trying to be old and grumpy and important, like you do when you're young. And then I was you, and it was all dashing about and playing cricket and my voice going all squeaky when I shouted. I still do that, the voice thing. I got that from you. Oh, and the trainers, and .."
"[She] barked at me: “No he isn’t!” But then I noticed that she had started referring to him as exactly that and bemoaning the fact that “her boyfriend was away” when David had to go off filming.’"
What did he make of David's Doctor? "David is a genuinely nice guy — and also a very fine Doctor Who. I think he’s benefited from the advances in technology there have been since my time in the early Eighties, when the sets used to wobble about. But he has done a fantastic job, and it’s sad that he has decided to move on." Speaking to Newsarama, Peter was quick to cotton on to an alternative way of looking at Time Crash! "It was a very cleverly written piece. It was about the 10th Doctor remembering being the 5th Doctor but also about David Tennant remembering watching me on TV... when he was young. A funny thing about ‘Time Crash’ was that David was surprised at some of what Steven pointed out in it. He joked that he hadn’t realised he sometimes resembled me with some of his behaviour and the ‘brainy-specs’ we both wear." We here at Warped Factor wish Peter a great day!